Thinking about trading your hands in for paws? If you're on the fence about the trade off, we'll give you a few reasons why paws are way cooler than normal boring hands. Paws also come with the luxury of having a weapon with you at all times. Claws work as a much better weapon than puny nails. Plus, you'll have the chance to get in touch with your primal side and you'll soon see that opposable thumbs are so overrated. You'll also see how convenient it is it is to catch and trap food... no more trips to the grocery store! You will still get a feel for what it's like to have paws by wearing these fingerless white paws. Seeing what you've been missing out on will be a big eye opener! 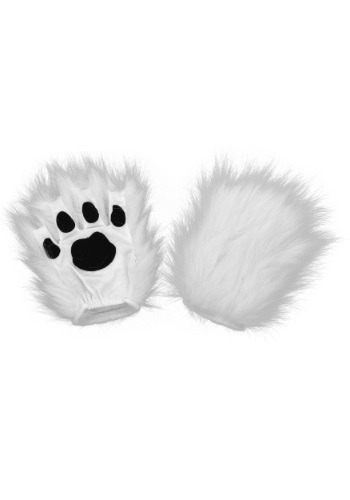 These fingerless white paws are worn on your hands like gloves. Comprised of snow-white fuzz and black pads on the inside, this accessory would be the perfect addition to any polar bear costume or kitty costume. Just slip them on to see what it's like to live on the wild side!